Uber’s aggressive global expansion has taken the $18 billion-valued private car company into well over 100 cities worldwide, many of which are about to experience a taste of the future when its ice cream delivery service goes global this Friday. The company says that the summertime initiative — which lets customers order ice cream on demand from the Uber app — will go live in 130 cities this Friday. For the record, that spans 38 countries and 6 continents, and is a significant rise on last year’s ‘Ice Cream Day’ initiative, which ran in 33 cities. So what is it that is special about this publicity stunt? Perhaps it is trivial, but the ability to order a refreshing ice cream from the Uber app will provide many thousands of Uber users with their first experience of a paid-for service from the company that has nothing to do with cars. 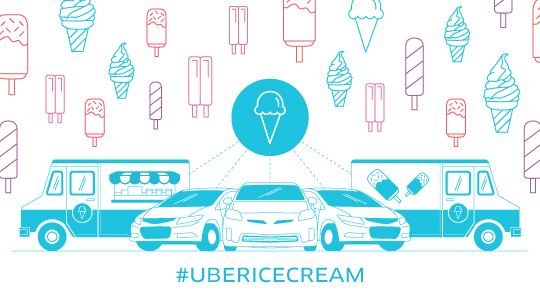 While it has offered other non-taxi services like lion dances and kittens-on-demand in some places, ‘Uber Ice Cream Day’ 2014 will be its largest rollout of ‘alternative’ services to date, reaching nearly 100 cities for the first time. That is significant because Uber is expected to expand its footprint into new categories and services as it develops its global logistics network. Already there is one example of the branch out. Uber launched a fleet of bike couriers in New York in April, but we can expect all kinds of different initiatives to come from the company in the future. While the company’s future progression is a hotly debated subject — just like its multi-billion dollar valuation — Uber’s goal of being in every major city in the world alone suggests that it harbors an ambition to go beyond only providing taxi services. And we’re not just talking ice creams here. Uber is in the middle of running a series of aggressive price-cuts in Asia — it has reduced the price of its ‘Black’ private car service by 45 percent in Bangkok, my city, and slashed fees for UberX in Singapore by a notable 20 percent, to state just two examples. It is likely to be running at a loss in many locations — it can afford to do so given its vast fundraising activities — but the greater goal is to build the kind of network that can be used to roll out new services to fit opportunities that arise. So enjoy your Uber ice cream this Friday, and remember the moment that Uber was just a car booking service with a sense of fun. The company may look a lot different and stand for many other things in the years to come.